Ok peoples. Time is running short on this one. This give away time period was a short one, so it’s time to jump in if you want a chance to win a 15′ Pedal Python kit from Pedal Python! 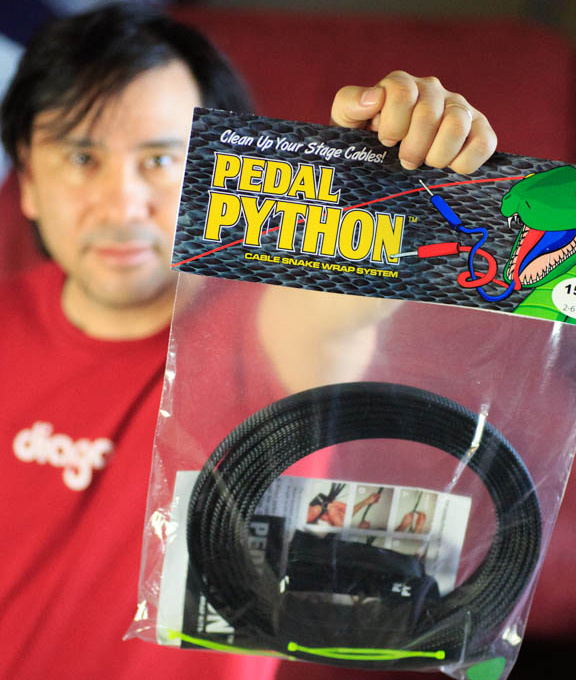 For those of you not familiar with Pedal Python, these guys have come up with a great way to ‘tame’ the cable. This isn’t a new concept in the office.. you’ve seen wraps for network/power cables for computers. Those obviously won’t work for gigging musicians. You need something durable, flexible and something that can be easily wrapped and transported from location to location. Pedal Python thought it out.. and have developed a great solution for this. With their tubed ‘weaving’ they’ve answered the flexibility and durability issues not found with other cable wrap solutions. This product is absolutely perfect if you’re running a pedal board with effects loop in/out cables, cables to multiple amps or channel inputs, etc. Things can get out of hand.. very quickly. Imagine just unplugging and rolling up one cable.. and you’re out of there! Simple.. smart.. and efficient! Pedal Python! The Divine Noise – $150 Gift Certificate Give Away Reminder – Divine Noise $150 Cable Gift Certificate Give Away Pedal Python Give Away! Would love to get this on my board.